When it comes to popular marine fish , the Ocellaris clownfish (Amphiprion Ocellaris) is the undisputed king. It shares its title with the Percula Clownfish (Amphiprion Percula) since they look entirely alike to most people. Both the ocellaris and percula clowns are the marine aquarium hobby's greatest ambassadors. Most people might think this is due to the hit animated film, Finding Nemo. They don't realize these clownfish were already popular before the film was released. The ocellaris clownfish is a staple offering in the hobby. They are heavily collected from their natural habitats in South East Asia, they are the most plentiful ornamental marine fish at the moment. Walk into any saltwater pet store and you'll find at least one ocellaris there for sale. They are also heavily bred in captivity with tank-raised ocellaris priced a little higher than wild caught specimens. Ocellaris clownfish are entirely orange with three white bands (outlined with black) around their heads, body and near their tail. To the untrained eye, both ocellaris and percula look exactly the same. Yet they are both slightly different physically. Percula clownfish have 10 dorsal spines while ocellaris has 11. Thankfully there's an easier method to tell them apart. Percula clownfish have thicker, more pronounced black outlines while those on the ocellaris are always thin. One of the cheapest marine fish you can buy, with specimens costing as little as $10. A few dollars more can buy a tank-raised specimen. Given a choice, never go with wild caught specimens as tank-bred ones are generally hardier and better suited to the aquarium. Ocellaris clowns are also known as the false clown anemonefish and the false percula clown. They are called anemonefish because they share a symbiosis with anemones. They have figured out how to escape the anemones powerful sting, it is thought they have a layer of mucus on their bodies that fool the anemone into thinking there's nothing there. 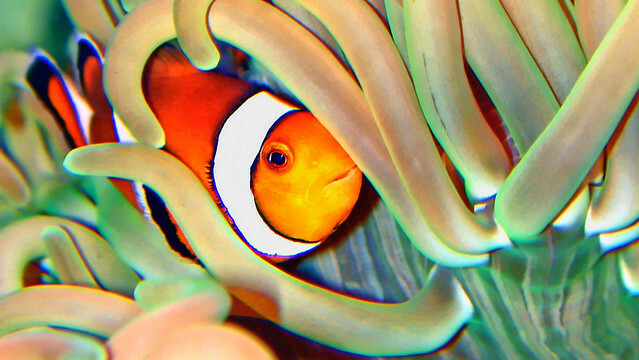 Anemones are not required despite clownfish needing one in the wild. I cannot give a guarantee that options 2 or 3 will work 100% of the time. Reaching a maximum of 3 inches in length, they are considered a small fish. All clownfish are site attached, which means they are usually around their territory (a small area) most of the time. Their territory can be anything from a pile of rocks to an anemone. Mushroom and elegance corals have been hosted by the ocellaris when an anemone isn't available. They can be housed aquariums as small as 20 gallons due to this behavior. These fishes are very easy to feed because they will eat just about anything. While they are omnivores in the wild, they consume both meaty and algae-based food in the aquarium. A wide variety of foods should be given. Prime reef, Formula One and Formula two are some good dry foods to offer. Formula two has an added amount of algae mixed in with seafood while Prime reef is mostly made up of seafood. The best pellet food on the market is those made by New Life Spectrum. Mix in some frozen foods like mysis shrimp or krill and they will be very happy. Overall, the ocellaris clownfish is a hardy fish that is a great choice for both beginners and experienced hobbyists alike. For further information, pictures and videos on the ocellaris clownfish you can pay a visit to my Hubpages where I have guides covering a wide variety of clownfish.